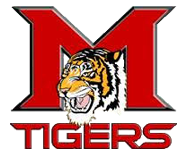 As school started back up after a week off from spring break, Mansfield hosted the first of three track meets at Tiger Stadium. The first of those included a “Ribbon Run” for local seventh grade athletes. Mansfield welcomed over a dozen schools to the Monday matinee. Throughout the 32 event schedule, the girls and boys off the Tiger seventh grade team collected a large portion of the available ribbons. Each lane race declared winners one through eight. The field events and distance races required individuals to place among the top 8 overall. Katelyn Corson continued her upward tend in the 400m dash. The first year track runner impressed with another first place in the one lap sprint. She was a winner at the Mena meet as well just before the spring break. Kynslee Ward also pushed the pace as the multi-event athlete excelled in the hurdles, high jump, and long jump. The rookie runner has traveled with the junior high team as well this season. She has collected two high point individual awards over the first half of the season. Peyton Martin, for the Tiger men, was the busiest of the boys. Her competed and placed well in the pole vault, long jump, high jump, and hurdles. He also lead leg to the sprint relay squad. Jonathan Norrris was also put to the test with entries in the horizontal jumps, hurdles, and relays. Teammate Zach Hayslip joined Norris, Donovan Walker, and Ethan Walker as part of the 4x400m relay. Hayslip and Donovan Walker also competed at the triple jump venue. Dakota Langford continued progress at both the discus and shot put ring. Turner Wright joined him there as the leading Tiger throwers. Kadynce Robinson, and Kadence Mathisen posted good numbers at the Lady Tiger discus and shot put circles. Eden Mounts and Raine Hecox joined in the hurdle races for the first time this season. Both ran legs on separate relays. Both were involved in the horizontal jumps. Emile Nelson, Charity Crowe, and Trinity Scott joined Hecox in the 4x800m relay. Mounts was the lead leg with Harlie Fuller, Kalie Sysakayavong, and Ward in the 4x100m exchange.